Before she left one of her friends told her about a sermon she heard about when God breathes life into bones and lifeless things. The Greek word which is used in every place in the Bible when God breathes life into people or things it is Pneuma (Numah). Ashley’s friend told her she felt like that would be a beautiful name for a little girl in Uganda and that Ashley was going to find a baby that needed to have life breathed into her. Today Ashley was out in Iganga village and a Pastor came to her and told her of a baby who’s mom was mentally ill and had conceived a baby but they did not know who the father was. Shortly after having the baby the mother left the new born with the grandmother. They were only giving her cow’s milk but she started to not take it so she has not been taking hardly anything. She is 7 months old but weighs only about 8 pounds. Ashley had found her. We received temporary guardianship until we get get all of the paperwork done and take her to the doctor. I already love her. She is so tiny, she is so fragile. She was limp Ashley said while they were in the village but tonight after some formula she was smiling and had life. God is breathing new life into her bones. The Breathe of God. 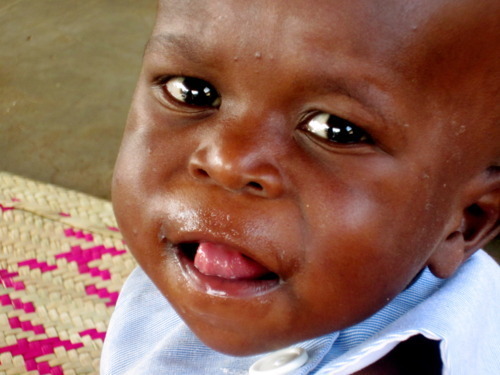 I ask for prayers for this sweet Karibo, that she will be healthy and everything will go smoothly. I had just woken up this morning to a situation that involves my life back home and was very upset about it. I was upset that it was distracting me from my work here and needing to focus on what is important. He brought me two gifts to remind me that He will always send us encouragement at the right time. Ashley who has encouraged me as a friend and Karibo who is our new baby who encourages me that life is so fragile and precious. He is so sweet to send her to us to love and watch over. It’s like the sun is shinging when the rain is pouring down. It’s like my soul is flying though my feet are on the ground. It’s like the world is silent even though I know it isn’t true. IT”S LIKE THE BREATHE OF JESUS IS RIGHT HERE IN THIS ROOM. So take this heart of mine, there’s no doubt…I’m in better hands now. We are waiting on this little guy to crawl, but even more so walk. As I was spending time with him today, making sure the diet is working, helping him get his motor skills, practice walking him with his little tiny hands wrapped around my one finger for dear life…I was along with everyone else cheering him on every step of the way. I reminded me of a sermon I heard that changed my perspective of God’s love for me. When Marvin does take those first few wobbly steps and falls hard down again, none of us are going to look at him in disappointment or frustration for not being able to walk 3 steps instead of 2. We will not yell at him and say, “Marvin, really it’s just one foot in front of the other, very simple. I can’t believe you can’t get this” We will react like he just ran a marathon and it’s like this with every child when they learn to take their first steps. This is a perfect picture of us and our walks with Him. We so often beat ourselves up when we can only take a few steps at a time and then we fall again. And again. And again. We think Jesus is looking at us saying the very same thing, “Dacia, you fell down AGAIN? This is simple, one foot in front of the other…how can you not get this?” in a voice of disappointment and anger. But just as a parent tells everyone after the first steps…calls everyone, post on facebook, and can’t stop smiling over their child’s accomplishment..that is Jesus for us. Every time we take a few steps He is acting just as a crazy as I will the day Marvin crawls or walks..but even more so. He knows the fall is coming after a few steps…but He will tell us to get back up and try again. He knows how many falls we are going to have before He makes us whole and look like we all desire to look like, to be who we desire to be, who He desires us to be. He knows that some of these falls are going to scratch us, scar us, and sometimes we might even lose a limb. But He knows how many falls we have to take. So after every fall, picture Him telling you to get up and go again. After the 1,100 fall you don’t want to get back up, but that is when He lays down face down on the ground next to you and reminds you that you only have 10 more to go…9 more, 8 more…we can do this…and then it gets to 1..and He calls you home. He loves us. He loves you. He is ecstatic with your two wobbly steps. He rejoices and cheers you on. *Had breakfast with Pastor Godfrey and a family staying at the Guesthouse from the states…we all encouraged one another as we shared recent stories of our own discouragments. Maybe some tears and coffee. I will make a very important note here..I, Dacia Newton, have only cried 3 times since I have been here. That in and of itself is Miracles. *We had 4 more Water Filters DONATED to our Babies home!! Huge answer to prayer! *The Pastors we have been working for over a year to get sponsored first were all sponsored today!! This is huge…lives will be forever changed because of this. More to go but so encouraged by this! *Was told by the team that just arrived from NC that a sweet lady in my life had donated enough money to pay for the extra baggage fees for all the donation bags that they brought over. She didn’t even know this team, she just wanted to be a blessing. I was blown away by her gift as well as the man who did not even know this lady but just said she knew me and wanted to help. Daily humbled by the people the Lord has placed in my life. *We also received money to take all of our children to the “Fair” use that word loosly this week! It will be such an experience for them…we are going to have lunch and make ice cream floats. *God has encouraged me in assuring me this is my calling by sending people to speak words and encouragement over me that don’t even know me. He has shown me countless times today that He loves me and is going to direct my next footsteps. *After a hard weekend with no shower, I come home to a HOT shower. My shower is always pretty warm but never HOT and it was only this morning…just tried again and it was warm. *Annndd monkeys were everywhere today. I pet them now, nbd. *I get to get up and go see this sweet face tomorrow…with hopefully MORE smiles awaiting me. And I always go to bed exhausted, but once again….full, actually overflowing. I know a lot of people who have the same struggle as myself: feet. For many reasons, I’m simply not a fan of feet. They are not the cleanest part of our bodies and you have to work hard to have manicured and pretty feet. Well, I don’t mind them as long as they are cleaned and well taken care of, otherwise I really have a hard time concentrating on something other than keeping the look of nausea from showing on my face. I love, though, how God will speak to us in our own ways…in our own pettiness. Only He would reveal this to me… in a very real picture He revealed my heart. Here in Africa, feet are the means by which people travel from home to work. Feet allow them to climb dirty and dusty roads to fetch their water and food. The water can’t be used to wash their feet, it has to be used to cook and drink. 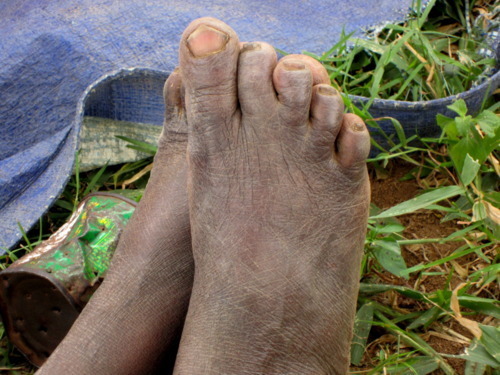 I have found often that I cannot look at the feet because I will never be able to do ministry again in Africa. Of course I’m joking, but it really has been funny how sensitive I have been to my awareness of feet here, because feet here are the worst that you can imagine. I was sitting with a group of women yesterday as we were encouraging one another and I was waiting on my time to speak. I was sitting in the grass with them and all I could see were feet. I know this sounds so ridiculous, but I was really trying hard not to look and stare because, like I said, I am not very good with keeping my facial expressions stoic. It is in this moment, the Lord in His humor speaks to my heart. Jesus did not wash his disciples’ feet to get them to be nice to one another. His goal was to extend his mission on earth after he was gone. We are to move into the world serving God, serving each other. As I sat there after traveling thousands of miles from Texas to Uganda, and now traveling even more to come meet these women, I thought I had such a servant’s heart. But God was quick to remind me that if he asked me to wash these women’s feet, could I do it? My first thought was absolutely not, there was no way I could wash these feet. But then I thought about how the disciples feet must have been just like these sweet African’s feet…dirty and calloused because they did not have shoes. Cut and scraped because they had walked many miles to get here. Jesus, my Jesus, the King got down and washed these dirty awful feet. He SERVED them. He has served ME. He has washed your feet and mine…not only our dirty feet but our dirty hearts. I sat trying to prepare for what I was about to say, and nothing came but tears. For the first time, I felt the weight. I could not imagine touching these feet, and then I pictured Jesus washing them. I suddenly realized that I have not reached that level of servant-hood yet. I pray that I will wash the feet of those who need to know that there is not one that is dirty enough that another would not serve him by washing his feet. Consider the cost when Christians ignore Jesus’ commands to sell their possesions and give to the poor and instead choose to spend their resources on better comforts, larger homes, nicer cars, and more stuff. Consider the cost when these Christians gather in churches and choose to spend millions of dollars on nice buildings to drive up to, cushioned chairs to sit in, and endless programs to enjoy for themselves. It will be better, not just for the poor, but for YOU too, when you abandon the stuff you are holding on to. Orphans are easier to ignore before you know their names. They are easier to ignore before you see their faces. It is easier to pretend they are not real until you hold them in your arms. But once you do, everything changes. I grew up in a home where my father was an Anglican by religion. We were twelve in our family both my parents calimd to be Christian by religion and so we grew up believing that we are saved and baptized. i was the youngest in the family; my father was a Judge (grade III). In the 70’s, many things happened in the country. Many people where killed, tortured and disappearing for ever. My dad refused o work for the government of Idi Amin because of what was happening. Army men came to our ome every time threatening him. This was in 1977, May of that year the day I cannot forget 22nd of June his friend came and broke the news to my Mum that he has been taken and we have traced for him but all in vain. My mother broke down in tears and we all started crying. Since that time, things changed in our home, we were separated and my brother had already joined rebel activities in order to fight Amin. We had no peace in our home which forced me to leave home to go in town and find work. I started playing boxing were I met other boys and we started drinking alcohol due to group influence. I became a real drunkard, rebel and bad behaving. This worsened when they removed my passport from me when I was going to turn a pro-boxer. Time came when I was controlled by alcohol. In the 80’s, I found myself looking for my mother in the village where she had gone after the death of our father. I found my mother and we stayed together but still with those bad behaviors. I was not controlled and very disobedient. For God loved the world that is why he gave his begotten child. God brougt me in the village to know him and a friend of mine my fellow drunkard preached the gospel to me. In 1987, I accepted Jesus as my Savior and in that same year, when I was 3 months old, I was chosen by my fellow believers to lead them as their pastor. I loved the Lord and served Him. Many churches were opened, many souls were saved. I was already married in 1984 and by 1991, I had three children. 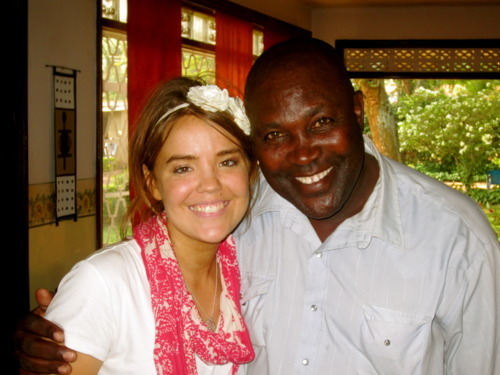 Pastoring in Uganda is voluntary work and now I did not have support for my family. As an experienced man on the lake, I decided to get a job to help the government stop smuggling goods and other things from Uganda to Kenya. Before I got this job, I had a dream three times in one week but the same dream. I dreamt when I had built a concrete building and this buildng was surrounded by people and I was not allowed to say anything. When I woke up, I thought I was dreaming of a grave and I I thought I was going to die but how because I was not sick, so kept quiet but I was even weak in my prayers. On Dec 9th, 1991, I was with other four men, a crew of five people. We went on a survey tour on the Lake Victoria to the Islands bordering Uganda and Kenya to find a place were we were going to station. A former pastor now thinking of money instead of serving God and longer talking of the Word. On the 11th of Dec., when we were in the middle of the lake when we saw a boat a coming towards us but we did not know that these were thieves expecting to steal what we had but when they came near, they realized that we had an army men in uniform in or boat and by suprise, they started shooting at us. Within a few my few companions were killed and during this time I said Lord in your hands I part my life, please help me, I have realized my sin. All of a sudden, thieves shouted and said these men are going to kill us and tehy took off living me with dead bodies which I took to the nearest police post and I was not helped but I realized all the case was put against me. All these days I was in the police cell for eight days and by then I had started preaching the Word of God to my fellow prisoners. On Dec 19th I was taken to court and imprisoned on remand for one and half years as they continue searching for more evidence agaisnt me that i killed my fellow crews. But every after fourteen days I had to report to court. Many prisoners were released and God was always very near me, within three days in prison I was chosen as a leader of my fellow prisoners a post which was always given to those who had stayed long on remand. On my 26th day on remand, when I was coming from chapel, I went to the dormitory where I was living, I slept on my mat, prisons had bad treatment and we were not even having blankets. God knows how He can keep prisoners. Now a word came to meand I said Lord, I have finished the work you sent me to do open the doors of the prison and let me out. I was astonished where this word came from; I looked around as if some different person had spoken it. I prayed and kept quiet. Many things happened in prison. Prisoners were released, the sick healed, I saw God’s hand. On the 27th day, following the day I had to report to court, for the second time. At night I had a dream when the prison walls were falling on me and I shouted saying, “Lord I’m dying out of air” I woke up very much frightened and the following day when I was going to court,three of our prisoners had a dream that I was released and they came in the morning saying farewell but I told them of my dream and promised I was going back for I’m their for one and half years. That day when I reached court, I was released. Since that time I shall never stop serving my Lord, whatever situation I might be in, I shall serve the Lord for I was disobedient and the Lord brought me back in the field to serve him. This experience has helped me to open new Churches and I hope God willingly, I shall continue serving Him.